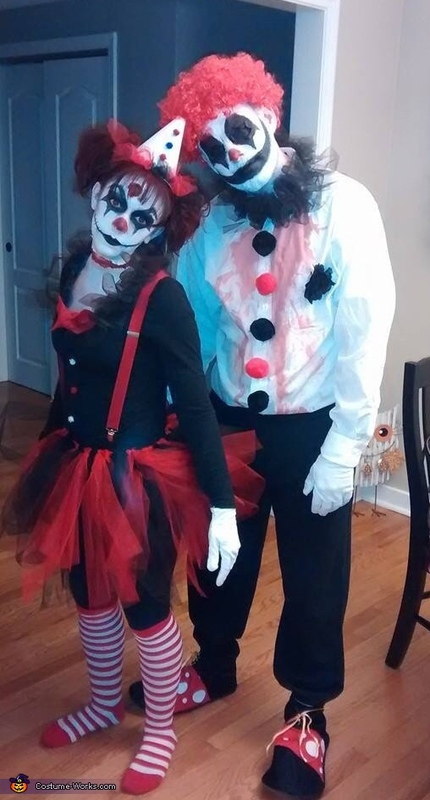 My boyfriend and I as evil clowns. I made my hat out of card stock, tulle, and Pom poms. Bow tie is made of felt and hot glued onto my shirt along with the Pom poms and tulle around the neck. The tutu is made of tulle and ribbon. Cream, power makeup, eyeliner, liquid latex and tissue were used for the makeup. His shirt was assembled with Pom poms and tulle also - cream makeup, eye-less latex prosthetics and eyeliner for makeup.